John Talabot is a youngster from Barcelona with a rather special way of approaching music. His influences range from flamenco to northern soul, from African music to traditional Asian songs. His first artist album, “ƒin”, has been released earlier this year and features one of my personal favourites ‘…So Will Be Now’. Mano le tough is another hero of mine, actually maybe even more so than John. Mano likes nature, eating vegetables and reading. An Irishman living in Berlin, with a talent for creating deeply epic house tunes. Listen to his remix for Flowers and Sea Creatures’ ‘The Sitting Room’. All of that and more, this Friday at Trouw’s Drukpers. Ellen Allien, is a Berlin based electronic musician and founder of the BPitch Control music label. For a long time now, Ellen Allien has been regarded as a fixed star in the electronic music galaxy. Her music style can be regarded as ‘allien dance’. Personally, the collaborative album she made together with Apparat a few years ago, has always remained on repeat on my iPod. This Friday, she’ll be showing us what’s new at Rembrandtplein’s AIR together with Shinedoe and local rising star Ici Sans Merci. Housegangsta DJ Sneak is back in town! Oh yeah, after all the festivals it’s time to hit the clubs and look for new horizons on the dance floors of Amsterdam’s electronica temple Studio 80. Sneak, the Porto Rican, Chicago based DJ is known for his dirty and authentic sound best to de described as ‘Old school? New school? Who even likes school?’. And did I mention this one goes on ’til nine in the morning? Enough good house music until the early morning by Pete Bandit & Jason Shae, Hoge Toon, Trish Former Friends, Tim Hoeben, Ici Sans Merci and Bert Jimmink. Prepare for what is to be a loooong weekend. 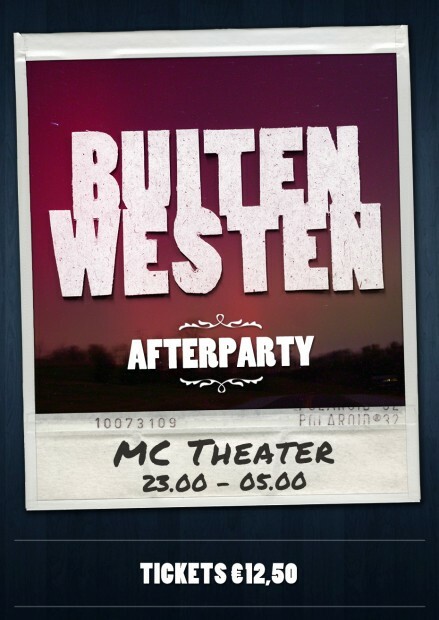 Buiten Westen is by far the hottest festival in Amsterdam. It has been sold out for about a month. If you (like so many) didn’t manage to get hold of a ticket, there’s always the official after party to go to. It will feature a selection of the same people, vibe and artists that’ll be present at the festival. Plus, it’s just a minute away from the festival area, right next to the Westerpark in the illustrious MC Theater. There are still some tickets left, so don’t be waiting too long. Have a fantastic hangover Amsterdam!